I wrote up a quick review on the first book in this YA Sci-Fi series, Partials, a few weeks back and I liked the book SO MUCH that I kept on reading. See, I have this habit of mulling over plot points in my head as I read, so most of the time, when I get to the ending of a book, I am usually right about how the story is going to end. But all of the books in the PARTIAL SEQUENCE left me guessing! Intrigued? Let’s get into my review of Fragments! Kira watched until she was sure there was nothing else to see, then watched some more just in case. You could never be too careful in Manhatten. In the first book, PARTIALS, our main character Kira discovered some devastating news about herself, which leads her to go on a sort of expedition to find out more about her father and her upbringing. If you recall, in book 1, we were introduced to a deadly disease known as RM. It’s highly contageous and has basicallt killed off 99.95% of the human population, as well as rendered all surviving humans as good as sterile, since all human children born since the outbreak (12 years before) get sick and die. So humanity, human and partial alike, are on the verge of extinction. That’s why I really like the above quote because it could be talking about anything. But in this instance, Kira, one of only 30,000 remaining humans, is lurking through the dead city of Manhatten, watching out for possible combatants as she picks her way through Partial territory, unsure of what she is searching for, but knowing just enough to keep her and the reader going. And then there is Samm. Oh! I cannot tell you how much I love Samm! He is a Partial Infantryman, all humans supposed enemy, but he became an outcast when he disobeyed a direct order from his company’s general and helped Kira. Now he’s flying solo, searching for a way to cure Partial Expiration; a terrible “disease” programmed into every partial ever created. Basically, it means, that after 20 years of sustained biosynthetic life, the partials begin to rapidly age, 50 years in a few days, and so on, until they die, or expire. Throughout the jarring and, often difficult plot of this second book the characters reflect upon their motives versus actions, wondering if the ends truly justify the means, and finding that all too often, the answer is no. Of course that answer changes depending on each character. The plot made me think. It made me question myself and my own motivations. How would I react in this situation? Would I take away another persons right to choose to satisfy my own feelings on a matter? By the end of this book, I felt like I leanred something from the characters that I invested my time in. I don’t think there was anything about this book that I didn’t like. Except maybe Samm’s devotion to his Partial buddy, Heron. OH, and this book (unlike book 1) does end on a pretty BIG cliffhanger, so make sure you’ve got RUINS handy when you get there! 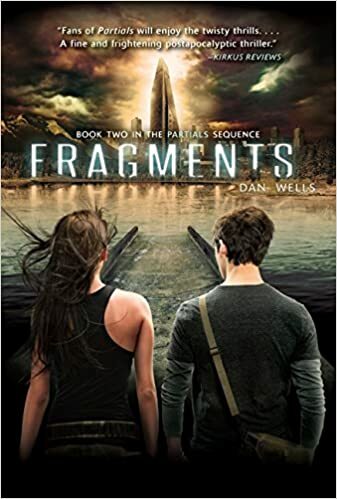 If you haven’t guessed just yet, I’m awarding FRAGMENTS by Dan Wells, FIVE STARS! Have you read the Partial Squence? What did you think about it?